Two Words = "Game Changer" Two days jam packed with engaging activities focused on making a living as a professional creative. 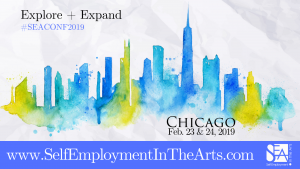 From large keynote sessions to hands-on learning opportunities to one-on-one mentoring, you'll be exposed to an arts business eco system you won't find anywhere else. Whether you're looking to explore making a living with your creative talents or wanting to expand your current pursuits, you'll leave better equipped to continue on your journey. This event is open to all. Visit the website for ticket discounts.